Pachycaulos is a genus with a single species. That species is P. nummularia, formerly classified with another quite different species as being in the genus Neomortonia. While both are epiphytic or saxicolous herbs with slender, pendent, repent, or scrambling stems up to 1 m long, growing on damp, shady rocks or epiphytically on trees in lowland or montane forests, the flowers are completely different. 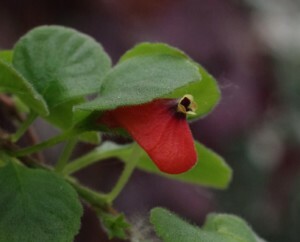 Recent research has confirmed that the two species are in fact not closely related, although neither is closely related to any other known gesneriads. The former N. nummularia has been assigned to its own genus, Pachycaulos, while N. rosea remains a Neomortonia. Pachycaulos nummularia has dramatic red-pouched flowers implying pollination by hummingbirds. It makes for a fine horticultural subject if its requirements of cool, moist conditions are met.